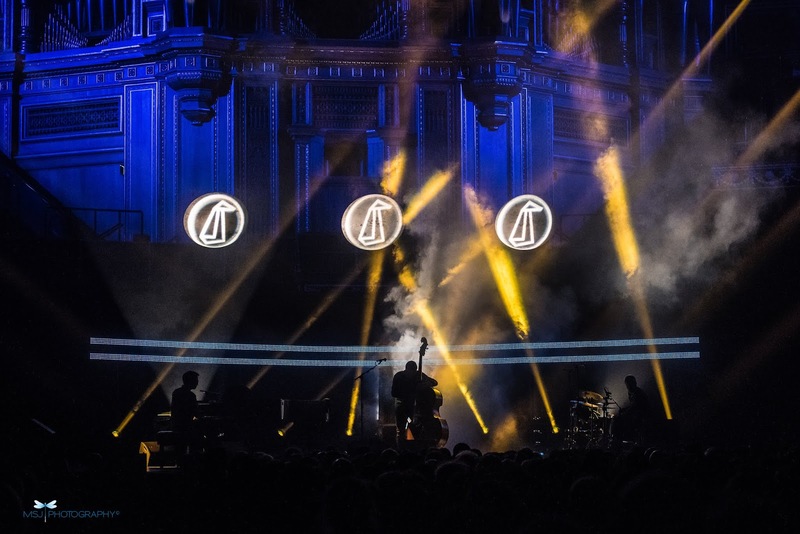 Jazz gigs are not generally synonymous with large, oval, grandiose spaces that have too many associations with flag-waving prom-lovers, and looking at GoGo Penguin’s list of tour dates, it seemed that the Albert Hall was something of an anomaly in amongst their other ports of call, both in terms of capacity and style of venue. So when the three Mancunian musicians, pianist Chris Illingworth, bassist Nick Blacka and drummer Rob Turner, trooped onto the stage, they seemed a tad daunted by the vastness of their audience and the space they were about to fill with music. But fill it they did, mostly with tunes from their latest album A Humdrum Star, released on Blue Note earlier this year. 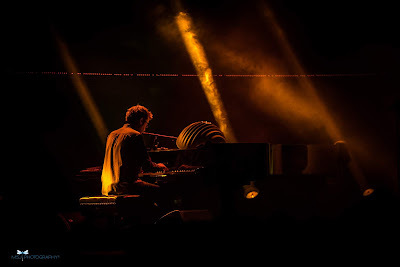 Things typically build up from a single hammered note from Chris, or from the slightest hint of a riff by Nick, or in response to a darkly persistent pulse laid down by Rob, and then slowly but surely they build an edifice of sound from this foundation. Their ideas mutate, spreading from one musician to the other, as they mould each simple motif into a cosmic landscape. 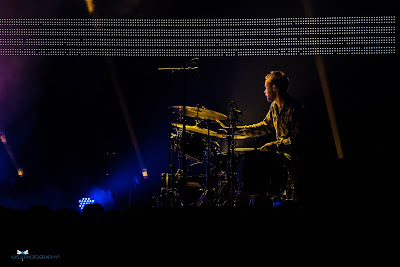 The inspiration for their latest album came from Carl Sagan, but while his comment was intended to play down the importance of the sun in the context of our galactic neighbourhood, GoGo Penguin seem to regard it more as a challenge; their music seems to want to explore and celebrate our being here. So in the first stretch we were treated to Prayer, Raven, Bardo and A Hundred Moons from this new album, then One Percent from their previous album v2.0. 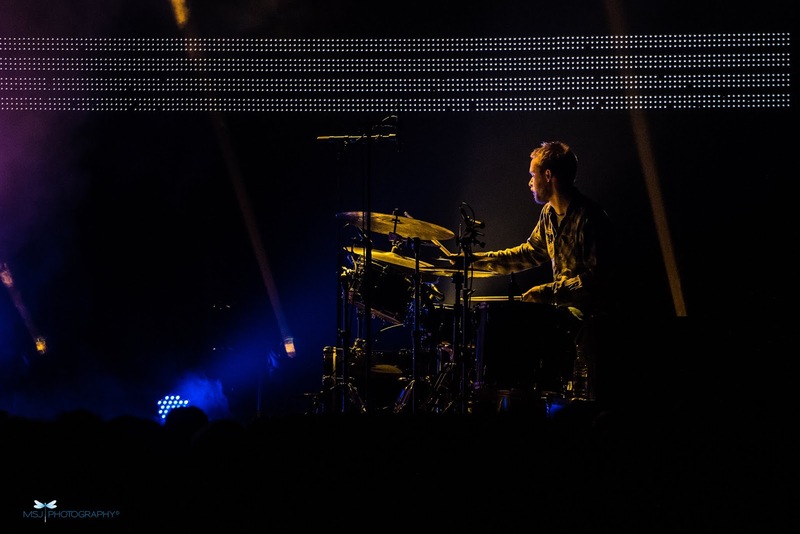 Halfway through the tune Ocean In A Drop, I began musing about the secret to GoGo Penguin’s success, about what makes them more than a drop in the jazz ocean. Was it their choice of name – apparently selected in the green room just before they performed their first gig, as their eye fell on a strange grubby item in the room that looked a bit like a penguin? Or was it their fortuitous sequence of signings, first to Gondwana, then Blue Note, and all the attendant publicity this has courted? Without meaning to sound churlish, there are plenty of other equally unassuming, self-effacing, non-commercial, hard-working, accomplished and talented jazzers on the circuit, so what’s caught the attention of a much wider audience, that’s enabled this trio to reach a level of success other jazz line-ups can only dream of? Lacking an obvious answer, I simply allowed myself to tune into my senses like every other person around me seemed to be doing, and be mesmerised. GoGo Penguin lure you into a trance-like state, they toy with your emotions, feeding some primal need with jolts of energy, artfully varying the tension, the volume, the texture and creating a sense of expansiveness, all the while playing instruments that look completely conventional, yet leading you to suspect that somehow they’ve been souped up into another dimension. True, Illingworth’s grand piano had a strange ridged protuberance sticking out of the top and a weirdly sonorous quality at times, and Blacka’s acoustic, sometimes bowed, bass often had a reedy, synthy sound. Meanwhile, Turner seemed to be wielding more than two sticks, but it might just have been an illusion, because his hands were moving so fast. 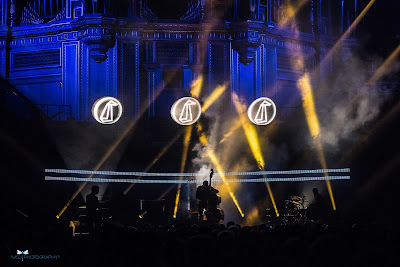 Then there’s the attention to visual detail: they have a nifty logo, which was repeated on three luminous disks above their heads, and a backlit band of LEDs that when combined with the smoke and cut through with pinpoints of coloured light, silhouetted and dissected the band in a way not often attempted at a jazz gig. They claim their music sounds like who they’ve been listening to, and it seemed to me that must have encompassed a fair amount of classical minimalism, especially given the fact they recently toured with their new score to accompany the film Koyaanisqatsi, whose original soundtrack was written by Philip Glass. The one-set show concluded with tunes like Reactor and Transient State, by which time I was definitely in an altered state myself. Drifting back to the tube, I could hardly recall the two engaging support acts from the early part of the evening, Andreya Triana and Sunda Arc. But no matter, I got what I came for: a taste of the dizzy heights a humdrum jazz outfit from Manchester can rise to, given half a chance. London, we need to up our game!